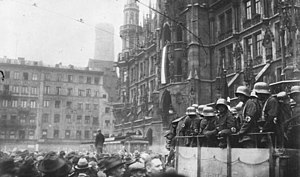 The Marienplatz in Munich during the Beer Haw Putsch. Putsch failur, arrest o NSDAP leadership. The Beer Haw Putsch, an aa kent as the Munich Putsch, an, in German, as the Hitlerputsch or Hitler-Ludendorff-Putsch, wis a failed coup attempt bi the Nazi Pairty leader Adolf Hitler — alang wi Generalquartiermeister Erich Ludendorff an ither Kampfbund leaders — to seize pouer in Munich, Bavarie, during 8–9 November 1923. Aboot twa thoosand men marched tae the centre o Munich, whaur thay confrontit the police, which resultit in the daith o 16 Nazis an fower policemen. ↑ 1.0 1.1 Dan Moorhouse, ed. The Munich Putsch. schoolshistory.org.uk, accessed 2008-05-31. This page wis last eeditit on 7 Julie 2015, at 15:51.